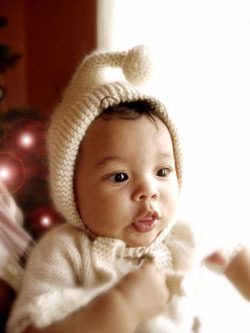 This monthly newsletter is brought to you from the Make Baby Stuff website. Each issue brings you up to date with new crafty happenings, contests, instructions, reader questions, more tips and our featured crafty artist of the month! It is your kick in the pants to get crafty! Handmade Baby Quilt Contest Winners! 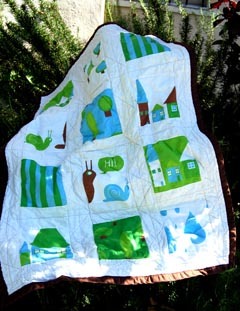 We had 180 entries to our handmade baby quilt contest, wow! 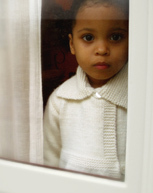 Let me thank each and every person who entered, looking at your lovely quilts and reading your entries was such a special peek into your world. Each of your quilts tell a story and this is what I love about quilting. I'm especially fond of the stories of quilting during a pregnancy, there is something so precious about creating something to later bundle up your baby in and of course the memories you'll later have about that time. So touching. Onto the winners...the judges have spoken! 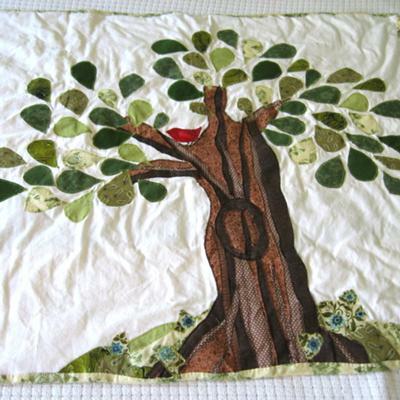 To view more of the amazing quilts submitted, go here. 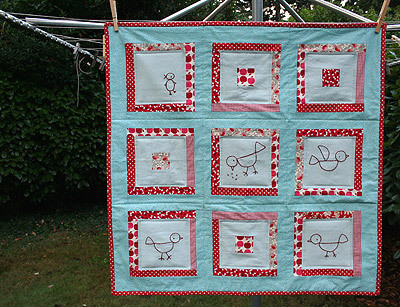 It is a treasure trove of baby quilt inspiration. If you haven't heard about Spoonflower yet, listen up! It is a new company that is inspiring the crafty sewing world because you can design your own fabrics and they'll print them up with no minimum order. I can think of loads of custom fabrics I want to design for baby clothes, crib sheets, nursery room curtains, stuffed animals, diaper bags, etc. Opening up this door of fabric design just floods my mind with ideas, so fun! 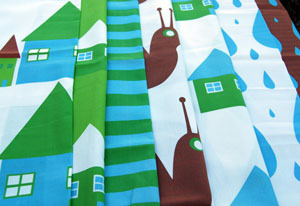 My most recent Spoonflower order was a whole line of fabrics that I designed with a quilt in mind. Inspired by the quilting contest, I was bitten by the quilting bug again and it gave me an excuse to place another custom order. My designs were just simple shapes drawn on the computer in a graphics program. However, you can draw something by hand and scan it in too. I also ordered a yard of fabric of my son's scribbles - which I'll share soon in a nifty project that I have in the works. 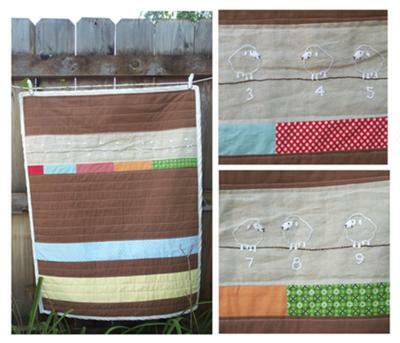 This would be a great way to turn older kids' artwork into fabric to use in quilts or other sewn keepsakes. They are now out of beta testing, which means anyone can use their service and you don't have to wait for an invite. The hardest part is deciding on what to design. Once you can pick then you are 1/2 way there! Who: Cynthia of Plumknit and Plumknit Yarn Supply is a tireless knitter and mother to three boys - the youngest just 10 weeks old. She has been in the craft business for five years but also happens to be a real estate agent, ACE certified personal trainer, licensed esthetician and a certified massage therapist. All were part of her path to where she is now - which is being a full time mommy and finding a few minutes each day to get her knitting fix. She is full of energy and even her knitting is a busy thing for her, not relaxing like it is for some. 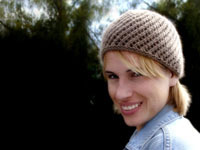 Although she knits classic, vintage style pieces that you "would imagine a calm granny might make while sipping tea" she is actually a frantic knitter. She knits like a fiend to achieve the end result and loves how she can get completely consumed in knitting. This is the perfect time of year for knitting and for purchasing cozy hand-knit items too! What lead up to starting Plumknit? To begin with, I don’t know where the name Plumknit came from. I get asked that question often. I wish I had a great story to tell about it but I pulled it out of a hat really. Yarn was piling up at my place. 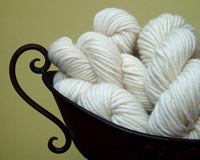 I started selling off some of my yarn stash to fund my cashmere habit. Most of the items I was knitting I couldn’t use myself. I would knit the item because I liked the pattern or the pattern intrigued me. With the yarn piling up and random projects I couldn’t use piling up the only thing that made sense was to sell the things. I’m a cloth diapering mama and one of the sites I frequented for cloth diapers was an online marketplace called Hyenacart. I opened a store there, Plumknit, to sell some of my knitted items and then shortly thereafter opened a sister store there, Plumknit Yarn Supply, to sell my fibers. You see, I had discovered a source for the most amazing cashmere I had ever touched and I had to share it with my fellow knitters and, er, fund my habit. What is your main source of inspiration? Vintage patterns. Over the years I have collected 100’s of vintage magazines, booklets & leaflets. The worn yellowed pages, the tears and rusty staples, there’s history to the books that intrigues me to no end. Of course vintage patterns have their downside, quite often they are hard to follow with lingo that’s not used anymore and pattern mistakes that have gone unrecognized not to mention the fact most of the patterns call for really thin yarn, which makes for tedious knitting. What was your goal when you started out and have you reached it? No goal, I was just doing what pleased me and it evolved, is evolving. When it stops being fun then I’m done. What is your favorite part of your creative process from idea to completion? I’ve really enjoyed the social aspect of this business it ties in to the creative process as the people I meet inspire new ideas. I joined Ravelry, an online knitting & crochet community, and started a group there that actually meets in real life once a week. So, I must say that my favorite part of the process besides the knitting of course has been the people I’ve crossed paths with, online and in real life, and all the different directions those relationships have led me. Well, since I’m knitting for the final result and not the process my least favorite part is finishing (sewing seams, making ties, sewing on buttons, blocking). Once the knitting is finally done, the finishing is what stands between me and the satisfaction of seeing the final result. Grrrrrrrrrr. When do you find the time to create? Good question. Often, I happen upon it. The baby’s asleep, the kids are at school, it’s daddy’s time with the kids…HURRY, get out the knitting needles!! Really, most of my work gets done at night when the kids are sleeping. I have to be diligent about designating time to knit, design, correspond with clients, do my buying etc. It’s not easy and I must admit I get really frustrated with the speed at which time flies. What are your tips to balance business and family? Don’t just jump into starting a business. Information gathering is key. Find out exactly what’s involved in running your business, assess if you really have the time to maintain it or if you need to keep your craft a hobby. Once you think you have it figured out then have a “work time”/“family time” schedule and stick to it. What do you do to ensure that you don't burn out? I won’t/don’t work too hard. I rarely take customs. I knit what inspires me and then if someone wants to buy it great! Are you crafty in other ways? If so, what do you make? Knitting is my first passion, I’ll pick up the sticks before I get out any other crafting supplies but I also dye yarn, sew, make paper crafts, paint, tie dye, embroider, stamp, stencil & crochet. My "to do" list is long. Any future business plans? Hmmm, I’m really happy just knitting for pleasure, of course I love it when someone wants to own something I made but I knit because I HAVE to so I wouldn’t say I necessarily have business plans, just knitting plans. I suppose it would be fun to create a Plumknit pattern book someday or own a brick and mortar yarn store but with my kids so young and needing so much of my time and attention those things aren’t likely to happen any time soon and I’m good with that. If you had to design solely with just one yarn from now on, which one would it be and why? That’s easy, cashmere. My knitting took off when I discovered it. The way it feels as it moves through your fingers almost liquid, the lightness of the fiber, the incredible softness & warmth, it’s extraordinary. Thanks Cynthia! Visit her shops at Plumknit and Plumknit Yarn Supply and buy handmade! If you like this newsletter, please "email it forward" to someone you know who might appreciate it. If a friend did forward this to you and you like what you read, please subscribe now! As our site and community grows, I hope that you drop me a line and tell me what crafty baby stuff you are up to! Did you make something that was inspired by something on our site? Pretty please play "show and tell" with the rest of us! Often, having an audience for your crafting is just a kick in the pants that you need to get working. Feel free to send in tips or questions too! We love mail!